Making your own lunch can help you save money and stay on track when it comes to eating healthy. You know exactly what goes into your food (more nutritious foods) and what stays out (sodium, extra preservatives, and saturated fat). 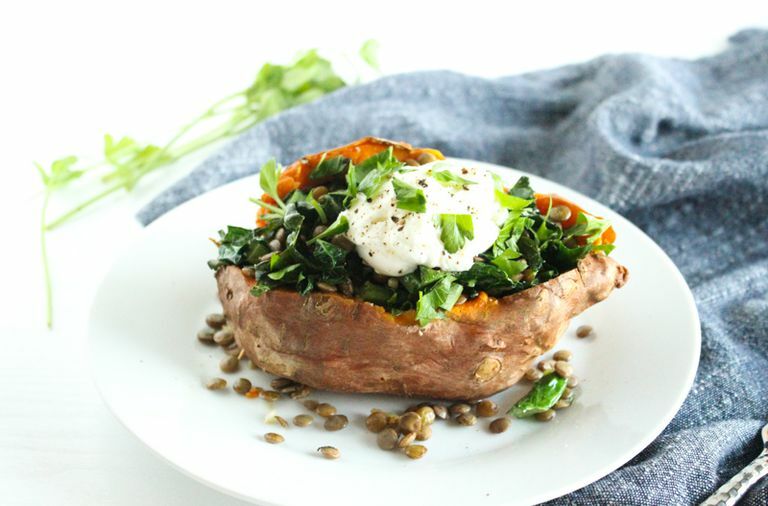 This stuffed sweet potato is a great lunch option that provides vegetables, plant protein, and plenty of fiber to fill you up without weighing you down. It's also full of vitamins A, C, and K. It has no added salt and uses just a little bit of heart-healthy olive oil, so you can feel good about your lunch. Vegetarian sources of protein like lentils, are also very budget friendly and available in bulk. Rinse sweet potatoes and pierce with a fork in a few places. Wrap each potato in foil and bake about 30 minutes, or until tender. Remove sweet potatoes from the oven and keep wrapped in foil until ready to serve. Meanwhile, prepare the lentils. Add lentils and water to a small saucepan and bring to a boil. Cover, reduce heat to low, and simmer 15-20 minutes or until lentils have absorbed all of the water. Heat oil in a small nonstick skillet over medium low heat. Add garlic and kale and cook, stirring gently, until kale is wilted, about 2 minutes. Add lentils and stir. Remove from heat. Remove sweet potatoes from foil and cut in half lengthwise, going only about halfway deep with your knife so that you aren't cutting all the way through the potato. Gently squeeze the two ends to open up the sweet potatoes. Fill the centers with kale and lentil mixture. Top with yogurt, parsley, and freshly cracked black pepper. You can use regular potatoes if you don’t like serving sweet potatoes. If you don’t have kale, use any kind of dark leafy greens, such as spinach, swiss chard, or mustard greens. For an extra protein boost, brown 1 ounce of ground chicken or turkey to add to this potato. Leave off the yogurt to make this a vegan meal. Cook a batch of sweet potatoes and a pot of lentils on Sunday to keep in the refrigerator so you can make this meal and others in a snap during the week. This delicious stuffed sweet potato is also something you can make ahead of time. Prep and assemble more than one at a time for multiple healthy work lunches. That way, you always have time to eat a healthy lunch. Over time, skipping the $8+ sandwich and chips at lunch will not only save your wallet, but it will also keep you healthy! To add even more veggies, serve this potato with a side salad or a cup of vegetable soup.